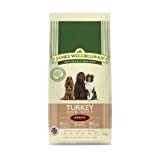 James Wellbeloved dog food is becoming an increasingly popular choice amongst dog owners. Famed for wholesome and healthy ingredients this sure is some tasty dog food! 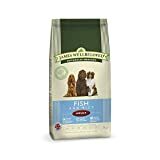 James Wellbeloved dog food is completely natural - in fact it's hypo-allergenic, meaning it's completely free from many ingredients that cause food intolerances, like wheat, gluten and dairy. To ensure it's an all-round healthy choice for your dog, it doesn't contain any preservatives or artificial flavours and colourings. It's delicate on your dog's digestive system and is the perfect food for an all-round super healthy canine diet! Which variety should I choose? 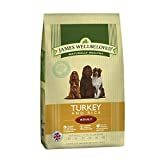 There's a huge variety of James Wellbeloved dog food - and the type you choose will probably depend on your dog's weight, age and level of activity. There's plenty of guides available on the packaging to help you choose the right sort - whether it's Senior, Light, Small Breed, Adult, Junior or Puppy! Whilst there's a small range of wet food pouches to choose from, it's mostly dry dog food in the form of scrumptious kibble. It's up to you what type you choose, depending on your dog's preference. From Lamb and Rice to Turkey and Vegetables, there's a brilliant range of flavours sure to tantalise any dog's tastebuds. If you're unsure which James Wellbeloved flavour to choose from, perhaps buy a few different ones to help you work out which one your dog seems to enjoy the most. As it's such a well known brand, it's available from most pet shops and supermarkets. Here at Loving Your Pet we love to buy our dog food online - it's more convenient for us and it often works out cheaper! From 1.5kg bags up to 15kg bags, there's plenty of options when it comes to size, whether you're feeding a small Chihuahua or a pack of ravenous Labradors! James Wellbeloved also sell some super tasty natural dog treats. Keep your eye out for their CrackerJacks and MiniJacks!